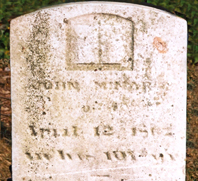 John Minard Sr. is strongly believed to be the son of Jacob and Maria (Nein) Minerd Sr. He was a pioneer settler of near Scio, Harrison County, OH, and lived into his 101st year, as his grave marker, seen here, attests. John and his wife Mary are known to have produced 11 children, at least 91 grandchildren and at least 280 great-grandchildren. Those numbers will increase as more are identified through research. John is thought to have been born in 1766 in Berks County, PA. As a boy, after the American Revolution ended, he moved with his parents to Emmitsburg, Frederick County, MD. His parents later moved further west, in 1791, to the mountainous border of Fayette-Somerset Counties, PA. John may have joined them on this trek, or may have remained back in Maryland. John and Mary are thought to have lived in Maryland and Pennsylvania on and off early in the marriage. Son Burget claimed to have been born in Maryland in 1812. They later moved to Fayette County, PA, following the same migration pattern as his parents. John is known to have been taxed in Fayette County in 1798 and 1801, in Bullskin and Saltlick (now Springfield) Township, where his parents lived. His listing for the year 1801 shows that he had “moved” which means he left the township and was not assessed for taxes. He also appears on the Fayette County censuses in 1800 and 1810. In 1817, John obtained a license to buy land from the Steubenville Land Office in Ohio, and received a 159-acre tract near Scio, in North Township, Harrison County. It is located in Range 6, Township 13, Section 1. This tract is about a half-mile from the nationally known Scio Pottery manufacturing plant near the town of Scio. Seen here is a rare old sketch showing settlers emigrating into Ohio circa 1817-1818, the same era that our Minards would have made this same move. The 1921 book History of Carroll and Harrison Counties, Ohio, authored by Judge H.J. Eckley and Judge William T. Perry, states that "The 'Pennsylvania Dutch,' more properly designated as the Germans, who emigrated from Pennsylvania and Virginia into what is now Harrison County, Ohio, were among the most honorable and thrifty set of pioneers." In North Township before 1814.--Jacob Albert, 1811; Martin Boghart, 1812, from Somerset county, Pa.; Christian Canaga, 1807, from Somerset county, Pa.; Jacob Canaga, 1807; Philip Creplever, 1812, from Washington county, Pa.; James English, 1812, from Fayette county, Pa.; John and Philip Firebaugh, 1812, from Somerset county, Pa.; Nancy Forney, 1812, from Westmoreland county, Pa.; Peter Forney, 1810, from Somerset county, Pa.; Joseph Gundy, 1812, from Somerset county, Pa.; Joseph Keiser, 1812; Henry Miser, 1811; Peter Smith, 1812, from Somerset county, Pa.; Thomas Yarnell, 1811, from Washington county, Pa.
of the border of John's farm. As of 1937, John’s acreage was still owned by a direct descendant, great-grandson Harry Calvin Minard. The Minards also are thought to have traveled back and forth from Ohio to Pennsylvania in the 1820s. Their son George is known to have lived in Fayette County, PA as late as 1828. But their permanent residence, and home farm, was in Harrison County, OH. Many years later, at his death, John was said to have “lived on the same farm, near New Market [Scio], for over 49 years…,” confirming the date of his settlement in Ohio. In 1826, John and Mary sold a 33-acre portion of their farm to Daniel Shetron for the sum of $60. Why they did this is unknown, though it may have been to raise funds to pay for the balance of their land. Both John and Mary signed this deed with an “X,” meaning that neither could read or write. In 1837, they sold 27 more acres of their farm to son John Jr.
Because they were illiterate, John and Mary would not have cared how the family name was spelled. This may account for the fact that the name has taken many spelling variations over the years. In the small country cemetery where they are buried, along with several generations of offspring, four versions of the name are found on the gravestones – Minerd, Minard, Miner and Minor. Mary's marker reads "MINERD" while John's appears to be "MINAR" or "MINARD." In about 1826, a Lutheran church was established in nearby New Rumley, believed to have been founded by Pastor Johannes Wagenhals. The following year, "Mr. Schafer" was the supply pastor to the new congregation, followed by Rev. Dewalt Rothacker who was there from 1829 to 1839, serving "with much success." 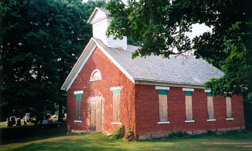 On April 26, 1834, John and Mary, along with their son and daughter in law John and Barbara (Shaeffer) Minerd Jr., became charter members of the congregation, named St. Bartholomew's Evangelical Lutheran Church, when it adopted its first constitution. The church was built as a log structure, "located at about the center of the present cemetery," in 1813. A second log building was built later, and in 1847 the present brick structure was erected beside the cemetery. At his death, John was said to have been "a consistent member of the Lutheran church for 75 years." Many years later, the two couples were mentioned by name in the 1925 book Memorial History of the Pittsburgh Synod of the Evangelical Lutheran Church: 1748-1845-1925, authored by Ellis Beaver Burgess. This chapter later was reprinted in Paul Miller Ruff's book of parish records, St. Bartholomew's Evangelical Lutheran Church (2000). 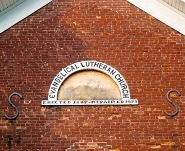 St. Bartholomew's Lutheran Church of New Rumley, which John and Mary joined ca. 1834 -- the building was erected in 1847 and repaired in 1879. Below: their names (spelled "Meinerd") in a 1925 history of the congregation. [Note – upon settling in Ohio, the Minards became early neighbors of the German family of Emanuel Henry and Maria (Kirkpatrick) Custer and their brood of young children. Later, the Minerd-Custer "relationship" would produce a baby boy who was John and Mary's great-grandson. Two of the Custers’ sons went on to great fame in American military history -- General George Armstrong Custer (1839-1876) and Thomas Ward Custer (1845-1876), who was the most decorated Union soldier in the Civil War. Both brothers lost their lives in the Battle of Little Big Horn. In fact, a bronze statue stands on the site of Custer’s birthplace in New Rumley, just a few hundred yards from two churches where several generations of Minerd-Minard cousins are buried. Click to see a page of other photo images of the Custers and Tom Custer's place in American popular culture. During their years on their farm, the family grew and flourished. The 1830 census of North Township shows that John, and sons George and John Jr., had separate residences. Sadly, Mary died at the age of 69 on April 26, 1845. She was buried in the cemetery of the Lutheran church they attended for many years. 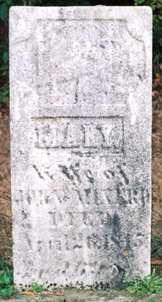 A grave marker was erected, seen here as photographed in 2001. A search has found no obituary coverage in the local newspaper, The Cadiz Sentinel, and no other newspaper obituary or account of her life has surfaced. ...sufficient boarding, lodging, washing and mending with good and sufficient clothing suitable for all seasons of the year and furnish him with all necessary attendance suitable for his age and capacity during natural life also to furnish him with good light shoes the whole year round and also to pay him four dollars in cash on or before the first day of May in each and every year during his natural life…. Mr. John Minor, one of the oldest men in Harrison county, died last week at his residence one mile south of New Market, in the 101st year of his age. He was born in Frederick, Maryland. He had lived on the same farm, near New Market, for over 49 years, was a consistent member of the Lutheran church for 75 years, and died in the full possession of his faculties. John was laid to rest beside his wife, in the Lutheran Cemetery, after 21 years as a widower. A marker was placed on his grave. About a year later, word of his death reached son Joseph residing in Champion, near Warren, Trumbull County, OH. The Warren newspaper, the Western Reserve Chronicle, published a short article on Sept. 16, 1868 (seen here). There was a major "typo" in the Chronicle article, referring to John's age at death as "111," when in reality it was "101," but the article provides important confirming proof of the father-son connection between the two men. 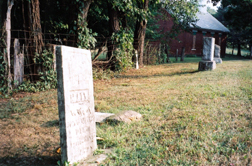 When photographed in August 2001, the grave markers of John and Mary were still legible, but John's was lying flat on the ground. Also buried in this cemetery are children, grandchildren and great-grandchildren, with markers reflecting four different spellings of the family name -- Minerd, Minard, Miner and Minor. Reflecting the family's longtime relationship with the family of General George Armstrong Custer, two of his infant brothers are buried in this cemetery as well. Three of John's offspring independently claimed to have been born on either Laurel Hill or in Fayette County, PA, including son George (1797), son John Jr. (1801) and grandson Isaac Van Horn (1830). His children bore the same first names as many of their first cousins, such as John, Solomon, Jacob, Burget, Samuel and Daniel. L-R: General Custer, Ambassador Bingham and Bishop Simpson, all famed natives of Harrison County, Ohio. John certainly would have known or known "of" three prominent Harrison County men who went on to national fame during the Civil War era -- Gen. George Armstrong Custer, killed at Little Big Horn, Montana; Congressman John A. Bingham, who prosecuted the assassins of President Abraham Lincoln and later was U.S. Ambassador to Japan; and Bishop Matthew Simpson, who preached the main funeral sermon of President Lincoln in Springfield, IL in 1865. Minerd.com expresses its thanks to David Shiltz for sharing his Kohl genealogy material in the development of these pages. Copyright © 2001-2006, 2010, 2012-2013 Mark A. Miner.